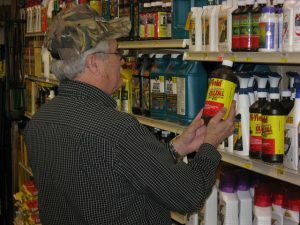 Deciding among the plenitude of pesticides on garden center shelves, all in colorful packages with large print promises, can be challenging. When buying a pesticide, you’re making an investment. And, as in making any purchase, you want to know what you’re investing in before you put your money down. Investigate before deciding if, when, what, and how to use a pesticide. Are you sure you have a problem that a pesticide can solve? Have you identified the real cause? Weather can lead to some strange plant/environmental reactions, so make sure you have the correct problem identified. An insecticide won’t do you much good against a fungus! If you’ve experienced the problem in the past, investigate and exhaust alternative solutions before you start searching the pesticide shelves. 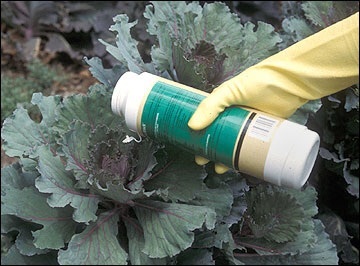 The pesticide label is the contract between you and the product’s supplier. The label tells you what the product will do and what you must do to make it work effectively. CAUTION: The product is slightly toxic if eaten, absorbed through the skin, or inhaled, or it causes slight eye or skin irritation. WARNING: The pesticide is moderately toxic if eaten, absorbed through the skin, or inhaled, or it causes moderate eye or skin irritation. DANGER: This pesticide is highly toxic by at least one route of exposure. It may be corrosive, causing irreversible damage to the skin or eyes. Alternatively, it may be highly toxic if eaten, absorbed through the skin, or inhaled. If this is the case, then “POISON” must also be included in red letters on the front panel of the product label. 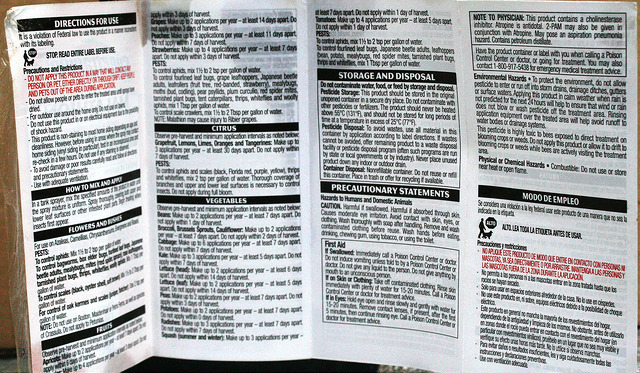 Pesticide label tells what product does, explains how to use effectively, and gives warnings. Will you need to mix the product with water or do you want to spend a little more for the convenience of a ready-to-use concoction? What equipment will you need? Rubber gloves? A sprayer? Make sure your sprayer is in good working order by testing it with water on the driveway . . . not on valuable plants! If you need to measure, make sure you have a measuring cup used only for pesticides! And rinse well after every use. Even a tinge of herbicide can work havoc with roses! Refresh your memory and adhere to the contract uses of the product. What does it say about application under certain weather conditions—wind, temperature, precipitation? Does the product advise on use near water bodies or when pollinators are present? Take a rainy afternoon to inventory your pesticide collection! Check the expiration dates and plan environmentally safe disposal of out-of-date pesticides. Maintain a pesticide usage record, including plants, problems, timing, and effectiveness. Your attention to up-front investigation and appropriate usage is a good investment, not only in any pesticide but also in your garden. 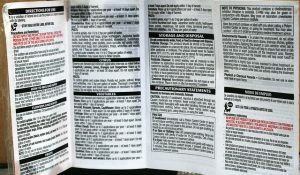 Article written by Glenn Palmer, Extension Master GardenerSM Volunteer. Take a survey of our pesticides – jugs, bottles, and plastic containers that we’ve accumulated over the years. Like milk that’s stored too long their contents can go bad and lose their effectiveness. That’s particularly true of those stored in an unheated space where they’re subject to freeze-thaw cycles or dampness and humidity. Or the opposite, a shed that gets into the nineties on many summer afternoons. But it’s not just the contents that goes bad! What about the label? Is it legible? What’s the chemical for? How much are you supposed to use? I suggest that anything older than two years should be disposed of. But how do you get rid of unwanted chemicals? 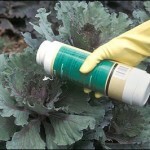 • Pesticides should be kept in their original containers. • Any unused product and empty containers must be disposed in a safe, legal manner; see the product label for disposal instructions. • Mark the purchase date on each pesticide container.